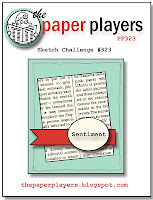 I've had my eye on the appealing sketch at The Paper Players all week. During the day, I had an idea for the sketch, so with work over and the weekend just beginning, I got into my craft room to see if I could make it happen. To make the sky, I put some peel-off stars on before I sponged the sky. 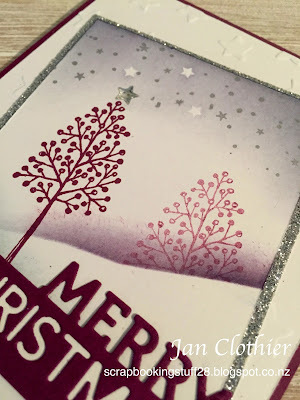 Then I stamped the stars from Holly Jolly Greetings in silver before removing the stickers. 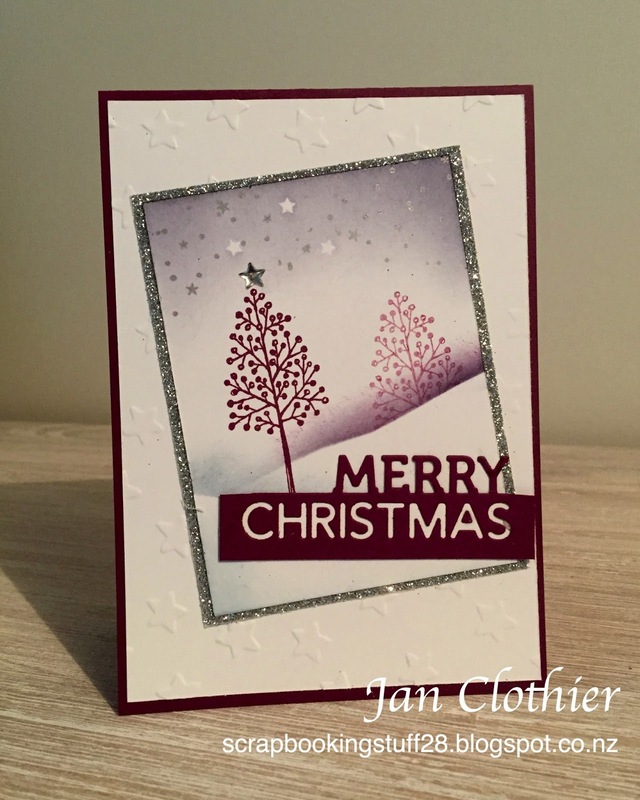 I was tempted to leave the little silver stars on but they detracted too much from the star on the tree. The Lucky Stars embossing folder, used on the card front, continues the starry night theme. The 'Merry Christmas' is cut down from Simon Says Stamp Holiday Frames die. I backed the Christmas so that I could put back in the bits of the R and A to make them whole rather than outlines only. I'm pretty happy with how it's turned out. 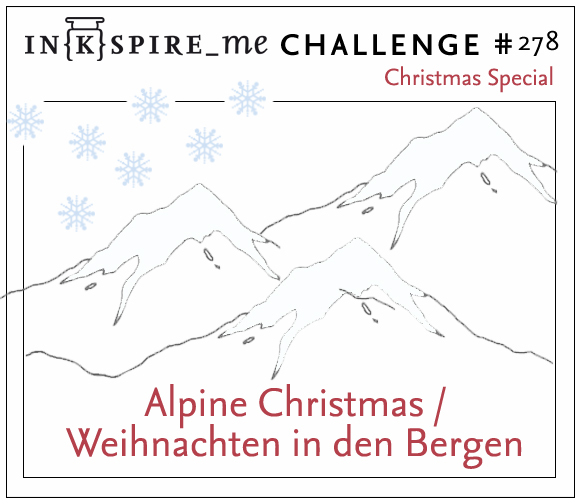 I'm also entering this card into the Alpine Christmas Challenge at Inkspire Me because I saw it this morning before work and it got me thinking about snowy scenes. 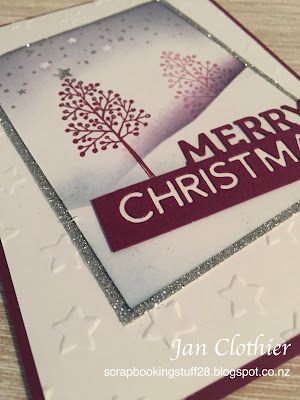 Other: Simon Says Stamp Holiday Frames die, Peel-off stars, sponges, Lucky Stars embossing folder, Silver metallic star shape. Oh my gosh, the colors you've used here are stunning! What a beautiful creation! I don't have that tree stamp, but I have one similar AND I have that die....might just have to try this myself. This is a familiar tune from me, right? I liked your card from last week too!!!! I am not sure about the sponging...I'm not so hot at that, though, LOL! Thanks for playing with us again! Beautiful! 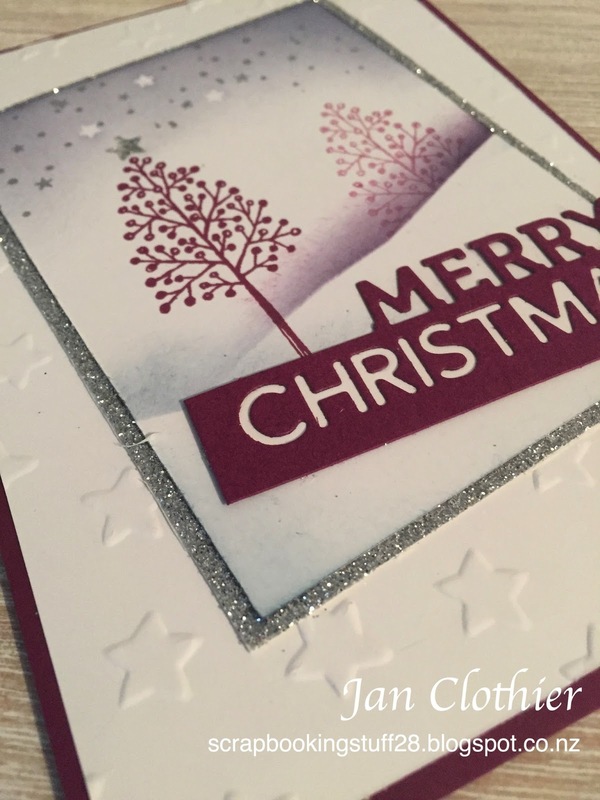 I love the glitter, the embossing...it all is designed so well. Thanks for joining us at The Paper Players! What a lovely scene and beautiful colors! Thank you for joining us at Inkspire me.